A Leicestershire strongman has broken his 31st world record - by pulling a bus with his ears. Manjit Singh smashed the existing record in Loughborough on Monday when he pulled the single decker over six metres (about 20 feet). 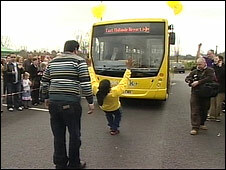 He is now planning to break another record in Derby this weekend by pulling a bus for 10 metres (about 32 feet) with just one hand. Afterwards he admitted the feat had been extremely uncomfortable. "It is very, very painful. It is not a little pain. You can see my ears... they must be very red, or purple," he laughed. Amarilis Espinoza from the Guinness Book of Records said: "It is actually a record. He's done an impressive 6.1 metres. "We actually expected him to do only two metres - that was the minimum to set this record." Manjit Singh's existing world records include pulling a double decker bus with his hair and lifting 85 kg (just over 13 stone) with his ears.